NGC's PHOTO PROOF service utilizes the latest technology in digital coin imaging to capture your NGC-certified coins in precise, full-color, enlarged images. You'll receive a laminated 8.5" x 11" bifold presentation piece that includes an entertaining and informative chronicle of your coin's background, prepared by NGC's Director of Research. Each PHOTO PROOF includes full-color, enlarged images* of the obverse and reverse, label information and a detailed analysis of strike, luster, toning and rarity. Pedigree and variety information may also be included, as well as a personalization of your choosing. NGC's PHOTO PROOF is a great way to share and catalog your collection. Duplicates and digital delivery are available for a small fee. * The coin is enlarged as much as six times its actual size (depending on the type of coin). If you're a member of the NGC Collectors Society, you can log in and access the NGC coin imaging services form. Not a member? Join today! 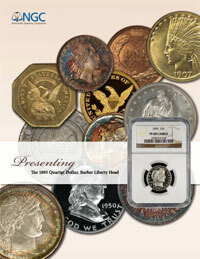 PHOTO PROOF Deluxe $65 each 10-14 working days Four coin images: Obverse, reverse and two detailed close-up images. Historical, variety, pedigree, etc., information included. PHOTO PROOF Duplicate $15 each 5-7 working days Any number of duplicate PHOTO PROOF presentation pieces created from the original digital image, in the same high quality. PHOTO PROOF 5-7 working days A PDF of your PHOTO PROOF is sent via email. Note: Resolution is optimized for screen display only, and not recommended for printing. PHOTO PROOF services for non-US coins is limited.